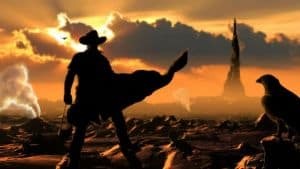 Amazon Head Confirms Dark Tower Series Still Alive, Lord of the Rings Details | Nerd Much? With the poor reception that the Idris Elba and Matthew McConaughey led Dark Tower received, many may have assumed that the potential TV series continuation was dead in the water. But according to the head of Amazon Studios, that may not be entirely the case. Jennifer Salke, head of Amazon Studios, recently spoke with Deadline regarding a wide range of topics. And one of said topics that came up was the future of their adaptation of Stephen King’s Dark Tower series. So luckily for fans of the series of novels, the project isn’t dead. In fact, the television series is “very much alive” according to Salke. But the executive also took the time to confirm some details about another big project under the Amazon Studios umbrella. Salke confirmed that a writing team has yet to be established for the network’s Lord of the Rings series. The project is still in early development as “the deal only closed like a month ago.” Salke did note that Peter Jackson’s involvement isn’t off the table at this point. They’re in talks, trying to determine what level of involvement the director wants to contribute – if any. Jennifer confirmed that the project would consist of “one big series” as opposed to multiple smaller takes. And while she wouldn’t confirm who it was centered on, she did say that they’re “not remaking the movies, but we’re also not starting from scratch. So, it’ll be characters you love.” Like say maybe this guy? For the full breakdown on what we know thus far on Amazon’s Lord of the Ring series, checkout our full breakdown of the upcoming series here. For Amazon’s Dark Tower series – let’s just keep our fingers crossed for the time being.